Doha, Qatar – 28th May 2017: KidzMondo Doha, Qatar’s one-of-a-kind edutainment city, celebrates the holy month of Ramadan for the first time by offering visitors unprecedented experiences upon their visit to the Kid-sized city. The indoor theme park will grant families and visitors the opportunity to celebrate the season of generosity and togetherness with special engagements for children, along with several entertaining activities; Saturdays to Thursdays from 9:00 AM till 1:00 PM and from 8:00 PM till 12:00 AM, and on Fridays from 8:00 PM till 12:00 AM. of traditional Ramadan practices, educating them with the significance of the virtues surrounding Ramadan. Another special on-ground engagement will be the presence of the Ramadan ‘Mesaharati’ – who will take a walk around the indoor theme park, beating his drum in honor of the traditional drummer that walks the streets before dawn to wake those that are sleeping, in order to have a small meal before fasting resumes. She added: The various activities at our kid-sized city promote the spirit of togetherness and provides our visitors memorable experiences that will nurture the values of Ramadan. As we get ready for Ramadan, we gear up for a purposeful time for children and their families, who will benefit from the plentitude of adventures awaiting them at our indoor theme park. We are positive that the time spent at KidzMondo Doha will not only impart knowledge and teach them valuable skills, but will also give them a richness of memorable experiences that would remain with them as they grow to become tomorrow’s leaders, policy makers, creative artists and honorable citizens”. The booming edutainment brand’s kid-sized city in Doha dovetails with the country’s rich heritage and deep-rooted cultural values, and its establishments have been developed in partnership with celebrated local and regional brands in a multitude of fields and disciplines, in order to create a conducive learning environment for Qatar’s future generations. 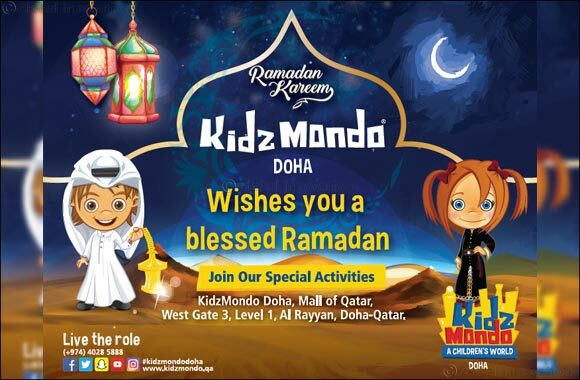 This notion is further enhanced during Ramadan to enrich the child’s experience with the practices and ethics of the Holy month being incorporated into their activities at KidzMondo Doha. As such, the youngsters can learn to make new habits, inspired by the spirit of the observed month. With a loyal following of young fans, the indoor theme park continues to provide children in Qatar with the unique opportunity to ‘live the role’ and take the first steps towards achieving their chosen professions and promising futures, and will continue to do so, more than ever, during Ramadan.